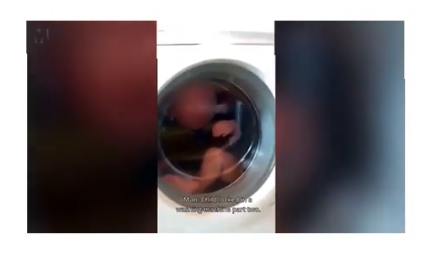 A 2-year-old scared toddler was locked inside a washing machine by his babysitter who then laughed as he filmed the little boy sobbing, police claim. Footage posted online shows Kacper pressing his hand against the door in a desperate bid to open it. Police say they have also found a photo of the boy being forced to smoke a cigarette. In the video obtained by Metro UK, a man can be heard laughing as the youngster cries. Although the boy was not hurt, cops have launched a child abuse probe. Social services are also involved. It’s understood Kacper's mum, a 21-year-old known only as Zaneta D, had left the little boy with a friend while she took her boyfriend to work in Radom, Poland. The video of the boy was allegedly posted online by a 19-year-old man named Mateusz S, who was arrested by police. He was later released without charge. A second man, Adam B, 18, who was looking after the child at the time, was also arrested. Prosecutors said Adam B and Tomasz K, 22, the boy’s father, could face child abuse charges. Mirosław Wachnik, District Prosecutor in Radom, said that if found guilty of child abuse the men face ten years in prison.